Guinea pigs live up to six years, so they have to pack a lot of living in that short time to keep the species going. Nature has a way of taking care of such things, which may explain why females can reproduce so much. Female guinea pigs go in season throughout the year. 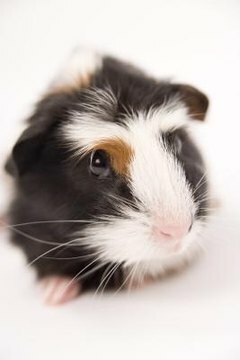 Female guinea pigs reach sexual maturity as early as 2 months of age and can reproduce until they're about 5 years old. Typically, the heat cycle lasts between 14 and 19 days, so a female can go in and out of heat every two or three weeks. During that time, there's about a half a day when she is receptive to breeding. If she becomes pregnant, she'll carry her brood for an average of 68 days, and it's common for her to go into heat just hours after delivery. It's not unusual for a nursing guinea pig to be pregnant at the same time. A female guinea pig shouldn't be bred before she's 4 months old and weighs at least a pound. However, if she's bred when she's too old, she can have a difficult time delivering her babies. Between 7 and 12 months of age, a female's pelvic bones fuse, making natural delivery extremely difficult, usually requiring a cesarean section. If you don't want baby guinea pigs, discuss spay/neuter surgery with your vet or keep the ladies and gentlemen separate.